Grant Plummer, Tami Phillips, Dan Palmer, Ada Woodson Adams, K. Allene Kilgore and Liz Shaw (pictured clockwise from top-left) make up the 2018 Jenco Award recipients, honored for dedication and service to the region. 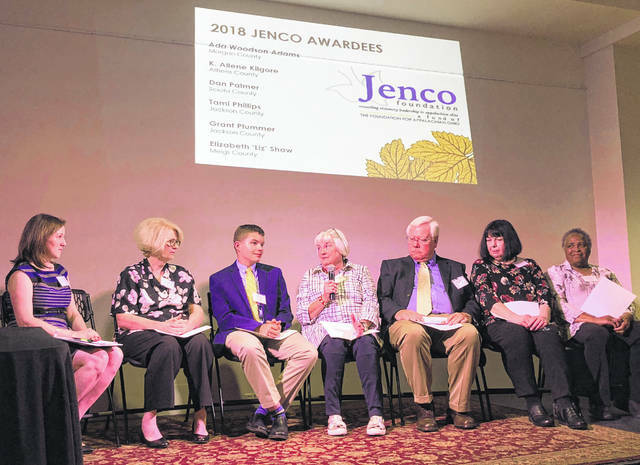 The Foundation for Appalachian Ohio’s Megan Wancyzk (left) facilitates a panel discussion among the 2018 Jenco Award recipients: Ada Woodson Adams, K. Allene Kilgore, Dan Palmer, Tami Phillips, Grant Plummer, and Liz Shaw (pictured right to left). MEIGS COUNTY — Digital connectivity isn’t just about getting on Facebook: it can also be a matter of life and death, if someone is unable to contact emergency services, for instance. That’s why Meigs County resident Elizabeth “Liz” Shaw has devoted countless hours addressing the lack of digital connectivity in the Appalachian Ohio region, which thwarts development and opportunity. 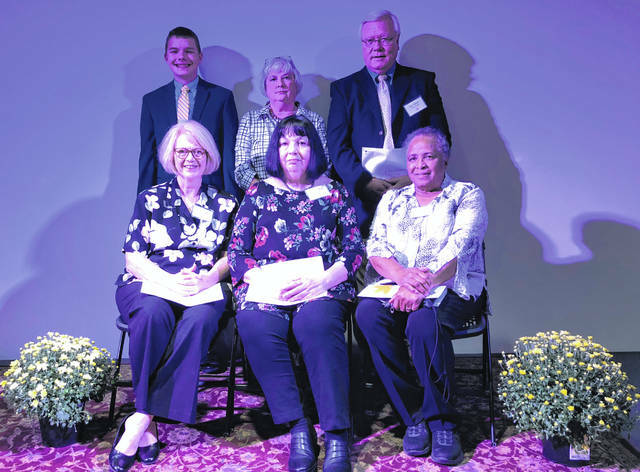 For this commitment to improving the regional quality of life, the Jenco Foundation Fund at the Foundation for Appalachian Ohio (FAO) recognized Shaw and five others with the 2018 Jenco Awards, conferred Sept. 27 at the historic Stuart’s Opera House. “I first understood the issue of connectivity as one of convenience, but the more I began to explore the issue and talk with others, the more I realized that this issue is absolutely crucial to the well-being of our area — and the more important it became to me to do what I could to address the problem,” Shaw said. Shaw has done a great deal toward that end; her commitment to addressing the region’s lack of digital connectivity has made her a regional leader. She founded the Citizens Connectivity Committee in order to tackle the lack of connectivity, which she says contributes to hampered economic development, educational opportunities, and public health and safety in the Appalachian Ohio region. As part of this initiative, Shaw has spent hundreds of hours detailing the impact of the region’s lacking connectivity by gathering ‘connectivity horror stories’ from Appalachian Ohioans, including students, first responders, the elderly, township trustees, and more. The Citizens Connectivity Committee, with Shaw at its helm, worked to organize the Appalachian Ohio-West Virginia Connectivity Summit and Town Hall, which drew hundreds of citizens, several state legislators, and representatives from the offices of Ohio and West Virginia officials including Ohio Governor Kasich, Senator Sherrod Brown, Senator Rob Portman, Congressman Bill Johnson, Senator Shelly Moore Capito, Senator Joe Manchin, and Congressman David McKinley. The event also drew a representative from the Appalachian Regional Commission, and even prompted FCC Commissioner Clyburn to testify before a House subcommittee on the issues facing our region. Shaw is not simply a broadband advocate, however. Appalachian culture and history are also important to her, and she promotes traditional Appalachian music through her work as a professional folk musician and teacher. She currently operates a private music studio, where she teaches 35 students traditional Appalachian music on fiddle, banjo, guitar, dulcimer, and piano. Her business endeavors are not separate from her public service either; she regularly assembles her students for community folks dances and charity events, including an annual holiday concert which raises money for Arts/West in Athens. It is for this broad commitment to service that Shaw was recognized with a Jenco Award on Thursday. Since 2002, the Jenco Awards have recognized the region’s unsung heroes, who have devoted themselves to direct, caring action in the service of others. Nominated by fellow community members who witness their service and leadership in action, Jenco Award honorees are selected through a formal committee process and review. Jenco Award recipients receive an individual cash award to use in the manner most appropriate to their leadership. * Tami Phillips of Jackson County, who founded Make Wellston Beautiful and incorporated the group to raise a total of $1.7 million in grant dollars to revitalize the City of Wellston. The Jenco Foundation Fund and its annual award are named for Father Lawrence Martin Jenco, a Roman Catholic priest who committed his life to the service of others. Most notably, in the 1980s, Father Jenco served as the director of Catholic Relief Services in Lebanon, where he was eventually kidnapped and spent 19 months in captivity. Even in captivity, Father Jenco continued to serve, providing a necessary listening ear for others detainees, including journalist Terry Anderson. Following Father Jenco’s death in 1996, Mr. Anderson wanted a way to honor Father Jenco’s legacy of compassion and giving so he created the Jenco Foundation. Because the stories of Jenco awardees deserve to be shared and celebrated widely, the Foundation for Appalachian Ohio is partnering with Only in Appalachia, a student run organization aiming to re-write the Appalachian narrative through the power of positivity, authenticity, and storytelling. FAO and Only in Appalachia have come together to produce videos about the 2018 Jenco Award recipients, including Shaw, which will be released weekly on both FAO and Only In Appalachia social media channels, starting September 30. If you know someone in the Appalachian Ohio region who goes above and beyond the call of duty in service of others, please nominate that individual for the 2019 Jenco Foundation Fund Awards. The nomination window opens annually in the spring; in the meantime, sign up for the Foundation for Appalachian Ohio’s e-newsletter at www.AppalachianOhio.org or follow FAO on Facebook to hear when the call for 2019 nominations is released. For additional information about the Jenco Foundation and the award that honors Father Lawrence Martin Jenco, please visit www.AppalachianOhio.org/Jenco or call 740-753-1111. Information provided by the Foundation for Appalachian Ohio. https://www.mydailytribune.com/wp-content/uploads/sites/42/2018/10/web1_10.14-2018-Jenco-1-Award-Recipients_ne20181012155654391.jpgGrant Plummer, Tami Phillips, Dan Palmer, Ada Woodson Adams, K. Allene Kilgore and Liz Shaw (pictured clockwise from top-left) make up the 2018 Jenco Award recipients, honored for dedication and service to the region. https://www.mydailytribune.com/wp-content/uploads/sites/42/2018/10/web1_10.14-2018-Jenco-2-Awardee-Panel_ne20181012155656903.jpgThe Foundation for Appalachian Ohio’s Megan Wancyzk (left) facilitates a panel discussion among the 2018 Jenco Award recipients: Ada Woodson Adams, K. Allene Kilgore, Dan Palmer, Tami Phillips, Grant Plummer, and Liz Shaw (pictured right to left).